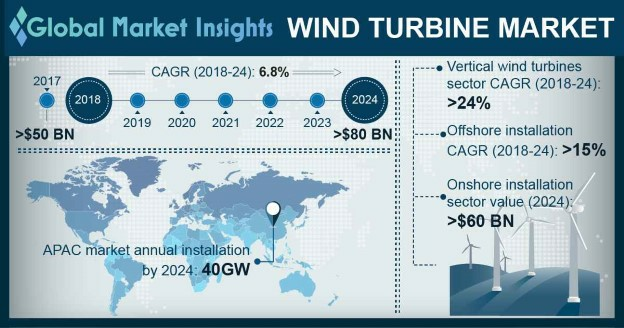 Wind turbine market size will surpass USD 70 Billion by 2024, as reported in the latest study by Global Market Insights, Inc. Growing investment toward effective R&D of wind-based power technologies along with rising acceptance of large capacity projects will extensively influence the overall product price. Rising industrial contention has rendered substantial decrease in the prices of rotor modules in line with operational effectiveness & volume manufacturing. Disposition toward improved blade size & tower length to integrate efficient resource operation will positively impact the global market dynamics.